Croxton postmill was built some time before 1803 on the north side of the Snoring Road to the northwest of the village. The O.S. map of 1885 shows evidence of a postmill in the form of the 4 piers and the outline of the track for the fantail. The sails powered two pairs of French burr stones and a flour mill. When advertised to be let in 1837 the mill was producing 50 - 60 coombs per week and by 1875 an iron windshaft had been fitted. A bakehouse was operating on the same site by 1837 and was still operating in 1864 but had been discontinued by 1875. A POST WINDMILL with two pair of French Stones, Flour Mill & going gears all in good repair, with dwelling house, stable, granary & other conveniences & one acre & a half of land, all Freehold, situate in the parish of Croxton with Fulmodeston, near Fakenham, Norfolk. Apply to Thomas Youngman, Millwright, Letheringsett or Edmund Nurse of Croxton aforesaid. To be Sold by Auction on 5 August 1834 at the Brown’s Arms Inn, Fulmodeston. A dwelling house with yard, stable and cart lodge, and about one acre of land adjoining. Also a Post Windmill in good repair and in full trade, standing on the said land. An excellent POST WINDMILL in Full Trade situate at CROXTON in Fulmodeston in the county of Norfolk, driving two pair of French Stones, with Flour Mill complete. Also a good Dwelling house, Bake office, Granary etc. & now in the occupation of Mr. Edward Adams, where an excellent Retail & Bag Trade of from 50 to 60 coombs per week have been carried on up to the present time. To be Let. With Immediate Possession. For a term of Years. A commodious POST WIND-MILL driving two pair of stones, together with a Dwelling house & Bake office & about 1 acre of Land, situate in the parish of Fulmodeston within 3 miles of Fakenham, where an extensive trade has been carried on. Apply to Mr. J. Mayston, Miller, North Walsham or to Mrs. Mayston No. 5 Hamlet Place, Norwich. 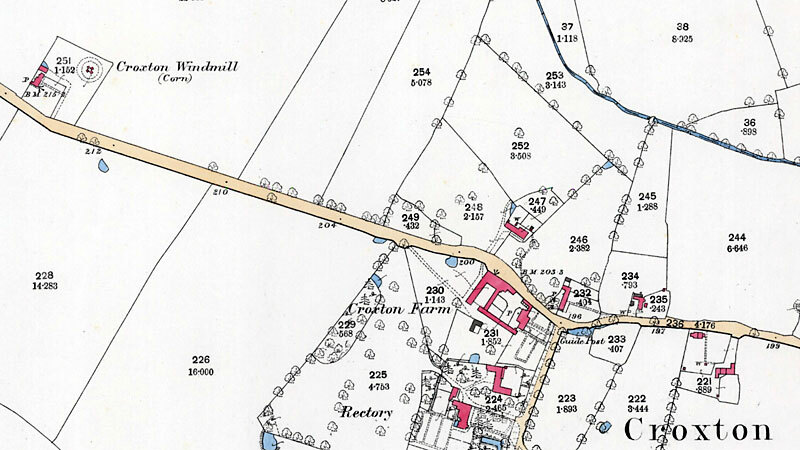 A POST WINDMILL driving two pairs of Stones, with a good Mill House, Bake Office, Stable & Cart Shed attached & about 2 acres of Land late in the occupation of Edward Adams in which a very excellent trade has been carried on. Apply to Messrs. Beckwith, Dye & Kitton, Solrs. St. Martin at Palace or to Mr. Bridge, Pottergate Street, Norwich. All that Valuable Freehold Property known as the “Croxton Mill” with the House, Stables & Outbuildings & one & a half acre of Land. The Mill, House & Premises have lately been thoroughly repaired at a considerable expense. Apply to Messrs. NURSE & DERRY, Solrs. St. James’s Street, Lynn. TO BE SOLD, a Powerful Post WINDMILL driving two Pairs of excellent French Stones, lately fitted with Iron Shaft & put into good repair. Now doing a good Bag Trade. Stands well for Wind. In the Parish of Fulmodeston, Norfolk. Good Dwelling house, large Garden & Pightle of good Land, together containing One Acre & a Half. Possession at Michaelmas. For Particulars apply to Mr. R. Mayston, 18 Oxford Street, Norwich. A capital & powerful POST WINDMILL driving two pairs of excellent French Stones, lately fitted with Iron Shaft & put into good repair, now doing a good Bag Trade. Also a Dwelling house with large Garden & Pightle of excellent LAND containing together about 1a.1r.0p. Messrs. Butcher & Bowler (of Norwich & London) are instructed to Sell by Auction at the Royal Hotel, Norwich on Saturday September 25, 1875 at 1 for 2 o’c the above mentioned valuable Freehold Property in the occupation of Mr. James West at a rental of £20 per annum. Particulars of Messrs. Blake, Keith & Blake, Solrs. Norwich, or the Auctioneers, Theatre Street, Norwich & New Craven Chambers, Craven Street, London, W.C.
As advertised in last week’s papers. To be Let, CROXTON MILL, Fulmodeston. The powerful Post mill driving two pairs of French Stones, lately fitted with iron shaft & repaired. Good Miller’s House, Stable, Cart Lodge, large Garden, a pightle of Land together containing one acre & a quarter. Possession on the 11th October. All that substantially built Brick & Tiled DWELLING HOUSE with Baking office, Stable, Cart lodge & capital POST WINDMILL driving two pair of Stones, fitted with all requisite Machinery & in good repair, standing in an Inclosure of Pasture LAND containing together with the Site of Buildings 1a. 1r. 17p. or thereabouts, now in the occupation of the Proprietor, Mr. Walter Tilney. The above Property is Freehold & arrangements can be made for immediate possession. Frederick William Kemp was born in 1841 and was master miller at Elsing_watermill when he married in 1868. He ran Witton_(Blofield_postmill from 1879 - 1879, then Croxton postmill and towermill from 1883 - 1890 and was at Strumpshaw smockmill in 1896.